Situated in Tiruchirappalli district, on the banks of the River Kaveri (also spelt as Cauvery) is Tiruchirappalli, a city known for its educational institutions, industries, and temples. It is shortly called as "Tiruchi" or "Trichy". 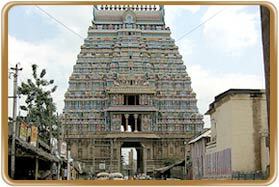 Trichy is the district headquarters of the district of Tiruchirappalli and has its name for tourist attraction. The city is a thriving commercial centre in Tamil Nadu and is famous for artificial diamonds, cigars, handloom cloth, glass bangles and wooden and clay toys. The most famous landmark of Tiruchirappalli is the Rock Fort Temple, a spectacular monument perched on a massive rocky out crop which rises abruptly from the plain to tower over the old city. Cholas in the 10th century AD. 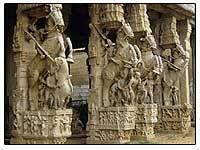 When the Chola Empire finally declined, Tiruchi passed into the hands of the Vijayanagar kings of Hampi and remained with them until their defeat, in 1565 AD by the forces of the Deccan Sultans. The city and its fort, as they stand today, were built by the Nayaks of Madurai. It was one of the main centers around which the wars of the Carnatic were fought in the 18th century during the British-French struggle for supremacy in India. § Viralimalai Sanctuary : Viralimalai is a small town situated at a distance of 30-km from Tiruchirappalli and 40-km from Pudukkottai. 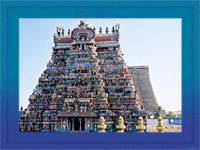 It is famous for its Murugan temple and the Peacock sanctuary. The town is bestowed with a large number of wild peacocks, which roam around the Murugan temple. § Sittanavasal : Located at a distance of 58-km from Trichy is Sittanavasal, a site of an ancient Jain monastery with fine fresco paintings in a rock cave. Many of them are typical of the 9th century Pandyan period and include exquisitely detailed pictures of animals, fish, ducks, people gathering lotuses from a pond and two dancing figures. There are also inscriptions dating back to the 9th and 10th centuries. Fresco paintings from the 7th century can be seen on the ceiling of the Ardhamandapam. There are many pre-historic burial sites around Sittanavasal and among the relics unearthed are burial urns, cists and Kurangupatarai. § Government Museum : Situated at Thirukokarnam, the museum is located near the Pudukkottai station, at a distance of 40 km from Trichy. The rare collections in the sections of Geology, Zoology, Paintings, Anthropology, Epigraphy,Historical Records, etc., are very interesting. The museum is open on all days except Mondays. 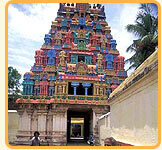 § Kudumianmalai : Kudumianmalai temple is located at a distance of 25-km from Trichy. The presiding deity is Lord Sikhagireeswara. There are beautiful sculptures and a thousand pillar-hall within the temple. § Rock Fort Temple : The Rock Fort temple complex in Tiruchirappalli is a collection of three temples - the Manikka Vinayakar temple at the foot of the hill, the Uchhi Pillayar Koyil at the top of the hill and the Taayumaanavar Koyil (Shivastalam) on the hill. This Shivastalam is a rock cut temple on a hill and is the most prominent landmark in Tiruchirappalli that can be reached by a flight of steps on the way to the famous Ucchi Pillayar temple. § Gangaikondan Cholapuram : GangaikondaCholapuram is located in Udayarpalayam Taluk (also spelt as Taluka) of Perambalur district, at a distance of 100-km from Trichy. 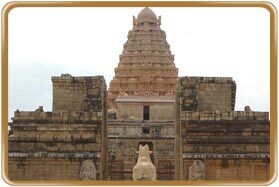 Rajendra I, a Chola ruler established GangaikondaCholapuram as his capital city and built a magnificent temple dedicated to Lord Shiva. Apart from the huge Nandi, there are some beautiful sculptures including a dancing Ganesha, a lion-headed well and a stunning piece depicting Rajendra being crowned by Lord Shiva and Parvati. 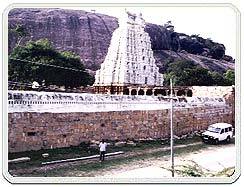 § Kodumbalur : Also known as "Moovarkoil", Kodumbalur is 36-km from Pudukkottai and 42-km from Tiruchirappalli. It was formerly the seat of Irukkuvelirs, who were related to the Cholas. Of the three shrines of Moovarkoil only two exist now. Boodhi Vikramakesari built these temples in the 10th century AD. The architecture of the temple is unique among south Indian temples. The sculptures of Kalarimurthi, Gajasamharamurthi Ardhanariswara, Gangadaramurthi, etc. are interesting masterpieces of art. 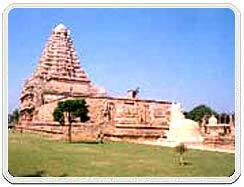 Nearby is the Muchukundeswarar temple of the early Chola period. § Sri Ranganathaswami Temple At Srirangam : Located 7-km from Trichy is Srirangam, the abode of the Supreme Lord, Sri Ranganatha, the reclining form of Lord Vishnu. The temple of Ranganatha, the largest in India, is of particular reverence to all Hindus. 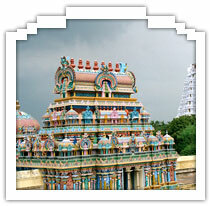 Srirangam is also listed as one of the Nava Graha Sthalas, or temples representing the planets. § Tiruvanaikkaval or Jambukeswara Temple : Situated 2-km east of Srirangam, this beautiful Shiva temple steals the show from the larger Ranganathaswami temple due to its excellent architectural design. The temple is named after the elephant, which is believed to have worshipped Lord Shiva here. Installed under an ancient Jambu tree, the lingam is partially submerged by water and meant to represent God incarnate as Water. § Avadayar Koil : Avadayar Koil, previously known as "Thiruperunthurai", is an important Shivasthala located at a distance of 8 miles from the Arantangi railway station and about 94-km from Trichy. The sculptural work of the temple is exquisite. 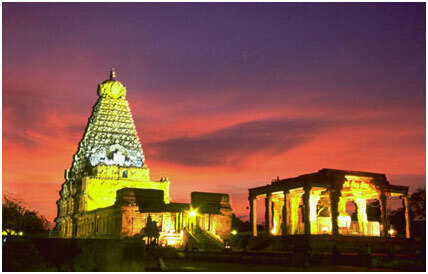 It is perhaps the best architectural marvel in South India. § Gunaseelam : Located at a distance of 22-km from Trichy is Gunaseelam, a place famous for its temple for Lord Vishnu, known as "Prasanna Venkateswara". § St. John's Church : Built in1812, St. John's Church has louver doors which open to convert it into an airy pavilion. The surrounding cemetery is also interesting. § Elakurichi : At a distance of 65-km from Trichy is Elakurichi, a place famous for the ancient church built by the famous Catholic Missionary, Constantine Joseph Beschi, popularly known as "Veeramamunivar". § Avur : Located at a distance of 30-km from Trichy is Avur, which is famous for an old church constructed by Father John Venantius Bouchet. The Float Festival celebrated during the months of March-April at the Rock Fort Temple draws crowds in huge numbers. 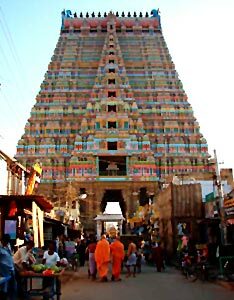 Mohini Alangaram, Vaikunta Ekadasi, Garuda Seva, Flower Festival and the Car Festival (December-January) are the other main festivals celebrated at Srirangam. Trichy is famous for its cigars and cheroots. Amongst handicraft are brassware, handloom textiles, pith models of temples and Rock Fort, wood and clay toys, jewellery, ornamental carved brass and copper plates inlaid with silver (Tanjore plates), brassware, silks, carpets and musical instruments. » Kannan & Co., Big Bazaar Street (for Indian musical records). Accommodation is available at the luxurious, middle class and small budgeted hotels, lodges, and the railway retiring rooms in Trichy. The TTDC offers a wide range of hotels, motels and youth hostels for a comfortable stay. 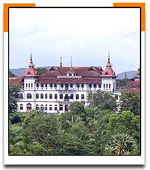 Besides, there are a number of unclassified hotels and lodges available. » Tourist Information Counter, Government of Tamil Nadu, Trichy Railway Junction. » Tourist Information Counter, Trichy Airport. Air : Tiruchirappalli has an airport (5-km) from the city. Various airlines connect Tiruchi with Chennai, Sharjah, Kuwait and Colombo. Rail : Tiruchi is an important junction on the Southern Railway. It connects Chennai, Thanjavur, Madurai, Tirupati, Tuticorin and Rameshwaram on the metre gauge, and Bangalore, Coimbatore, Mysore, Kochi, Kannyakumarai and Mangalore on the broad gauge. Road : Tiruchi is well connected by road with important places of South India. City bus service, tourist taxis, auto rickshaws and cycle rickshaws are available for local transportation.